BEE Protective Pesticide-Free Zone Declaration For Lawns, Landscapes and Pollinators! Pledge your organic and pollinator-friendly acreage and sign the Pesticide-Free Declaration! Pesticides are hazardous to health and the environment, and are unnecessary to have a beautiful yard and landscape. Pesticides are also toxic to bees and other beneficial pollinators. However, you can create pollinator-friendly, organic landscapes by eliminating pesticide use and planting pollinator-attractive habitat. Pledge your yard, park, garden, or other community or business-managed green space as organically managed and pollinator-friendly. Indicate how many acres (or what fraction of an acre) you can declare as organic and how many acres you would like. OceanBlueProject, the Corvallis-based company involved in mycoremediation, is involved with Saving America’s Pollinators Act HR 2692, a federal bill aimed at suspending use of the worst pesticides and also directing the EPA to perform deeper evaluation of the pesticides’ impacts on pollinators. 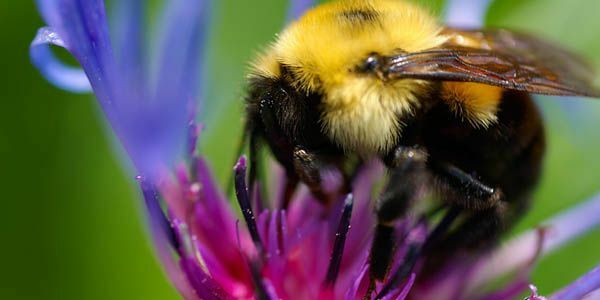 OceanBlueProject and their Sustainability Team will be visiting the Corvallis neighborhoods with a pesticide free Corvallis, "Bee Protective" door-to-door campaign, to help lower pesticides used throughout the city. OceanBlueProject partnered not only with Beyond Pesticides, a non-profit from the state of Washington, and Toxic Awareness Body of Oregon, with their main focus being A Safe School Route, campaign to help children have save travels to and from school, safe from Pesticides and toxic free bus route. Protecting our lawns and gardens will also help protect our Oceans, "Let’s not forget, everything runs downhill, right into our rivers, then the Ocean". Our goal is to bring awareness and eliminate this run off before it reaches the Willamette River and beyond," said Richard Arterbury.